When Big Friday kicks off the shopping season with heaps of hot deals, get ready to shop. For its own Big Friday Campaign, TPL Insurance is offering massive discounts on exclusive products that are only available on the TPL Insurance website from Nov 16th to Dec 2nd, 2018. No one wants to consider the possibility of something going wrong on holiday but unfortunately, it does happen every once in a while! Now imagine doubling the catastrophe by not having sufficient travel insurance to look after you in your emergency situation. Thankfully, TPL Travel Direct Insurance is easily accessible and affordable with our Big Friday Campaign. Whether you are traveling internationally, domestically, as a student or for pilgrimage, we are offering all our customers 35% OFF on all Travel Direct Insurance for the entire month and a special 45% OFF on every Friday till 2nd December. When you think of Big Friday deals, you’re probably picturing big screen TVs, PlayStations, home appliance or mobile phones – not car insurance. 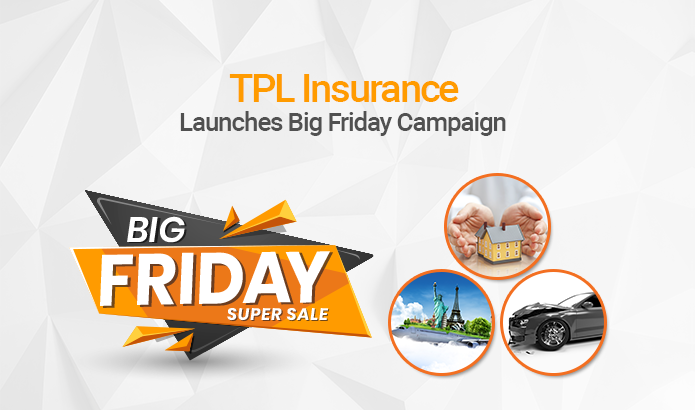 TPL Insurance’s Big Friday Campaign has become the best time of the year to shop for car insurance deals. For our Big Friday Campaign we are giving you the opportunity to purchase Auto Direct Insurance with a major 20% discount. If you thought that wasn’t good enough, you have the opportunity to save even more and get a 30% discount on all Auto Direct Insurance products every Friday till 2nd December. If you cash in on the offer and avail up to 30% off now, you get coverage for the entire year. For all the homeowners looking for a chance to protect your home and its belongings after spending millions on making it, TPL Insurance is offering you up to 45% OFF on Home Direct Insurance for our Big Friday campaign. Why waste time worrying about losing money in case of a natural disaster or an accident that puts your home at risk when you can insure your home and its belongings for almost half the price. If you don’t want to miss out on the Big Friday Campaign and all the fabulous prizes, please visit https://tplinsurance.com/products/ now.